Sweet, saucy, and from the slums, Rubina Ali and Azharuddin Mohammed Ismail both went from wretched poverty to international fame after starring in the 2009 Academy Award winner for Best Picture and Best Director, Slumdog Millionaire. But they just won't go to school, even though the movie's producer and director got the young stars placed in a Mumbai school and paid their tuition until they turn 18... and even though they've set up a trust that's dependent on the children attending school for the next seven or eight years. 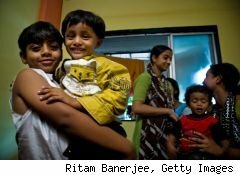 Ali, 10, and Ismail, 11, have average attendance of about one in three days, and though Slumdog producer Christian Colson and director Danny Boyle have urged their parents to accept their offer of apartments outside of the slums, only Ismail's mother has taken the moviemakers up on their offer. Ali's father has been shown "a half-dozen" apartments by the trustee of the two stars' trust, but has rejected them all and wants a $73,000 apartment. The filmmakers' response seems almost angry; "we're not here to negotiate," Colson told the AP, explaining that the $50,000 they have promised will be given to a charity if Rafiq Quereshi, Ali's father, doesn't accept an apartment for that price. Ismail's mom says her son isn't attending school more than 37% of the time because of his father's death from tuberculosis in September -- "he would cry often, so I kept him home from school for a while," she told the AP -- and Ali's father says she only made it to school 27% of the time because of a cut on her leg, and because the family's shanty was destroyed in May. Both families receive a $120 per month living stipend, which they could lose, as well. Calling it "tough love," Colson says the two children will lose the trust if they don't start going to school more regularly. Though school has been too much of a struggle for the Slumdog stars, they haven't missed opportunities to travel to London, Paris, Madras, Hong Kong, and Los Angeles, for the Oscar awards ceremony. Rubina has been promoting a book about her life, and Azhar's parents were quoted in May saying they'd never even heard of the trust fund. The filmmakers won't say how much is in the fund, although Ali's parents said it was worth $50,000. The situation is as ugly as the slums that also contribute to the movie's success, and it seems proof that, no matter how glamorous the story, no matter how bottomless the wealth, you can't fix poverty, even just for two sweet little kids.